National Health Blog Post Month, Day 9: My personal brand. As a Health Activist, you are a front-facing leader. What do you imagine you look like to your readers? What qualities do you possess? It’s ok to toot your own horn today – you have full permission to indulge. And don’t hold back. As a diabetes advocate, a person with diabetes, and a purveyor of all things awesome, I insist that what I write about be honest. 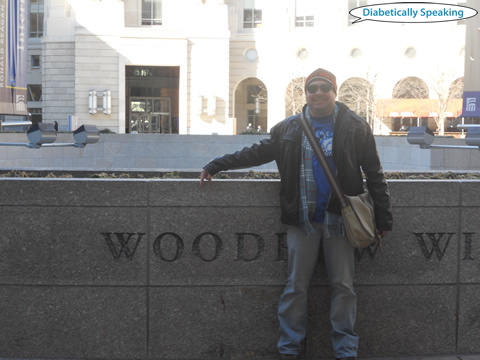 I want people who stumble across my bloggity blog to appreciate that what I’m sharing is me, my life with diabetes, and that it is genuine, and based on a real human bean’s perspective. Clearly, I have an extremely vivid imagination. I like to think of myself as a cartoon character, with a busted pancreas and a slight problem with blood sugars that fall faster than ACME anvils in a Wile E. Coyote cartoon. Some of my posts (I hope) are imaginative, and entertaining. I admire the creativity and ingenuity of people like Walt Disney, so maybe that is where my cartoon imagination comes from. As serious as life with diabetes is, it is also entertaining, and I try to share that. I’m a storyteller. Not to be confused with a liar. I like to read stories where there is a beginning and an end, and somewhere in the middle is adventure, good versus evil, and a bit of anticipation for what is going to happen next. There also has to be a point. Without a point…well, what’s the point? I’m also an educator. A librarian, actually. I like to provide people with information that they can use, and learn from, and appreciate. Nothing makes me happier than reading a comment or receiving an email from someone about a post I’ve written that echoes what they feel, what they deal with, or puts into words what they are going through. I’m a people person, and that connection reinforces the importance of sharing things about my so-called diabetes life. I hope that when my readers look at me and my blog, that they smile. Maybe occasionally they get a little watery eyed. Hopefully they laugh out loud, often. I hope that they are touched, even if it’s slightly inappropriate touching, and that they find a connection, hope, motivation, and support in that they are not alone with diabetes. No one should ever feel alone with diabetes. The clinque thing literally made me LOL. Great post! ahaha clinique clinicians! i was thinking of them just yesterday as i accompanied a friend to buy something at the bmw/mini store. did you know those guys wear white coats too? who do they think they’re fooling? also, lol @ inappropriate touching. we recently watched the first episode of the return of beavis and butthead, which included the punchline “heh heh, you were *touched*”. it’s so stupidly funny, and now my family can’t stop repeating it. talk about inappropriate! !